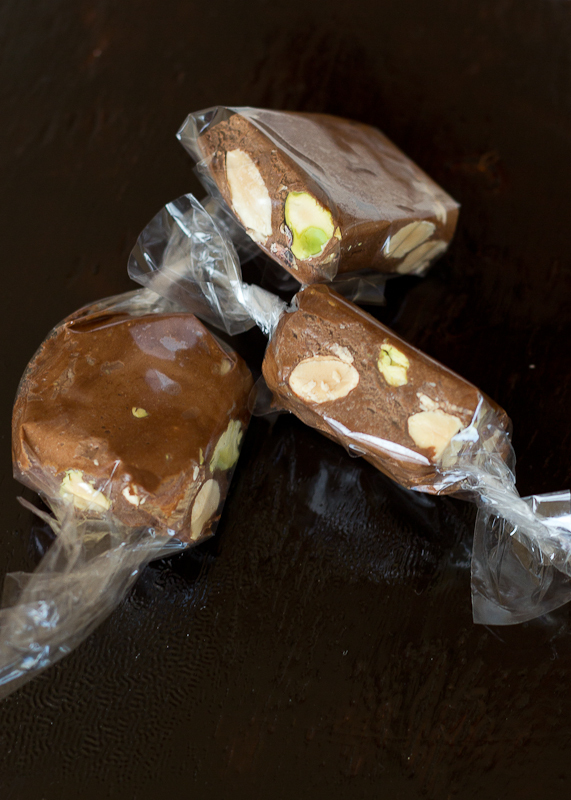 So we had to make Nougat. And a daring challenge it was. If it wasn’t for Rebecca, probably I never would have made this treat, because it doesn’t seam like my kind of thing. And that’s why I like the Daring Bakers, it makes you discover things that would otherwise have been left unknown. I’m not gonna lie, nougat is not a joke to make. You need to be very concentrated because burning is quite feasible. The stages are simple, but you need to be careful and having someone to help you doesn’t hurt (Thanks, honey!). I don’t have a stand mixer and I used my loyal hand mixer, a moment of silence in its memory is in order here. Once you pour the sugar into the meringue it gets very thick very quickly and you need a sturdy mixer at this point. 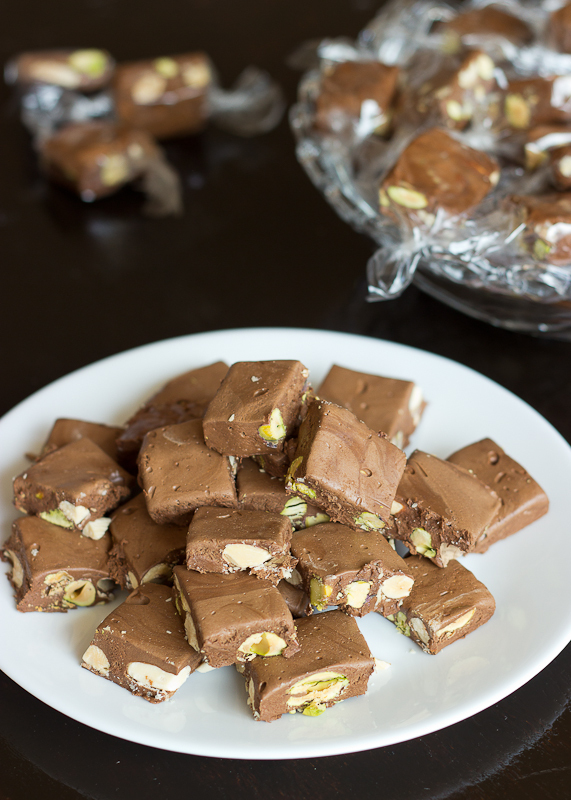 Mine just couldn’t make it to the end so I continued to mix the nougat by hand until it started to cool down. It was a laborious job, but the final result was definitely worth it! Honestly, I didn’t expect that I will like the nougat so much, I suspected it would be too chewy and hard for my liking. But it was nothing like that. It was soft, melt in your mouth goodness, and it makes me smile for three days now. I decided to go with a chocolate flavoring and also replaced the corn syrup with glucose, since no corn syrup is available in my latitude. Otherwise I followed the instructions very strictly and I can tell you that the recipe provided by Rebecca was spot on! 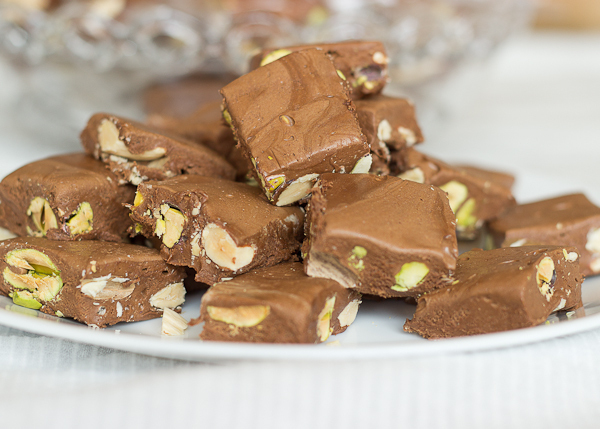 So if you dare, go make nougat! Start by heating the honey and glucose in a heavy-bottom saucepan over medium heat. Meanwhile start whipping the egg whites in a very large bowl on medium speed. The honey should reach 120°C/248°F, so when the temperature passes 100°C increase the speed of the mixer to high. When the honey is 120 °C remove it from the heat and gently pour it down the sides of the bowl with the meringue, still mixing on high speed. Reduce the speed to medium and mix the ingredients for the syrup in a large pan. Put the panit on medium-high heat, and let it boil until it reaches 154°C/310°F. Remove from the heat and slowly pour the syrup down the sides of the bowl. Increase the speed of the mixer to high and beat for 5 minutes. Continue beating on high and add the chocolate. 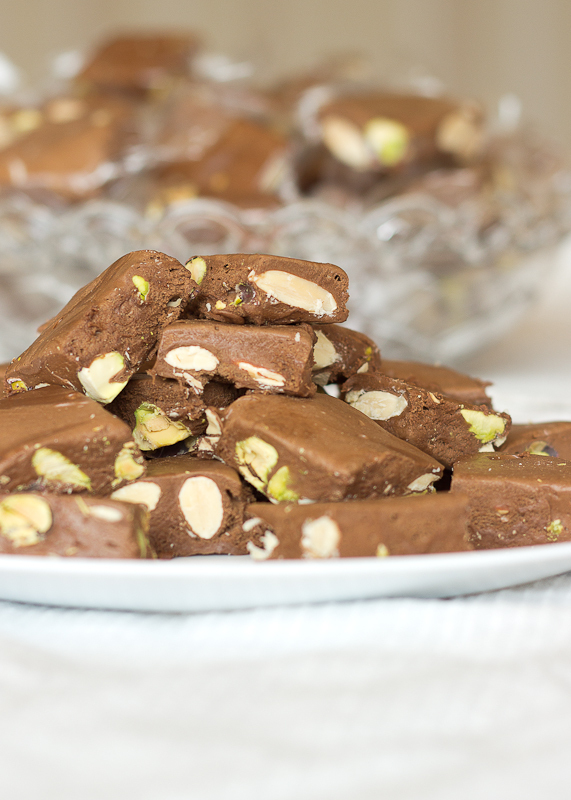 Mix until the chocolate is melted and fully incorporated into the nougat. Add the nuts to the mixture and fold in using a spatula. Grease the bottom and the sides of a 28×28 cm. (11×11 inches) baking pan and line it with baking paper(bottom and sides). 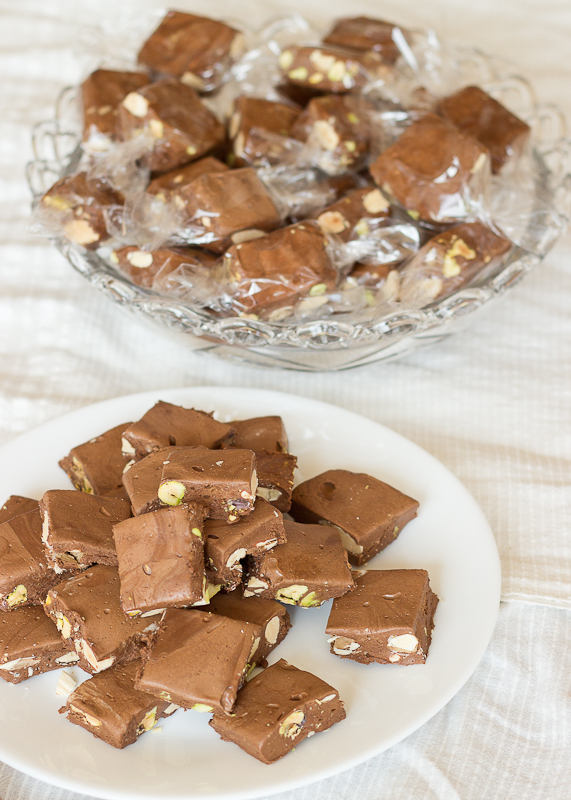 Pour the nougat into the pan and spread it as evenly as possible. Use half a lemon to smooth the surface of the nougat. Let it stand at room temperature for at least 24 hours, cut into pieces and enjoy! Check the detailed instructions of Rebecca here. Thank you, Carrie! I guess I needed a replacement of the mixer anyway. Lovely story and so great that you did this by hand. Wow, that’s hard work. Love your pics! I’m glad you enjoyed the challenge this month! 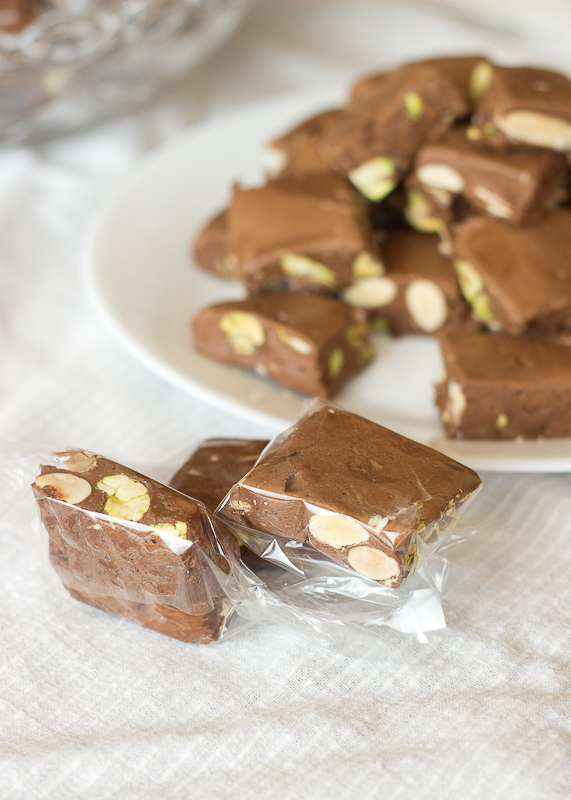 Your nougat looks beautiful. I can’t believe you had to finish this by hand (moment of silence for your hand mixer), that must have been so hard! Maybe this is a good excuse to get a stand mixer? That’s pretty much how I understand this sign. Thank you, Rebecca! Handmade, indeed! Thanks for stopping by!